Internet millionaire and Megaupload founder Kim Dotcom and his three associates are eligible for extradition to the US to face criminal charges over massive copyright infringement on Megaupload (now-shuttered), the court has ruled citing "overwhelming" evidence. On Tuesday afternoon, New Zealand District Court Judge Nevin Dawson told the court that the United States had presented enough evidence against Dotcom and his co-defendants and that they should be surrendered to the US. US prosecutors want Dotcom, and colleagues Mathias Ortmann, Bram van der Kolk and Finn Batato to stand trial on charges of copyright infringement, racketeering, and money laundering. "No matter what happens in Court tomorrow, I'll be fine. Don't worry. 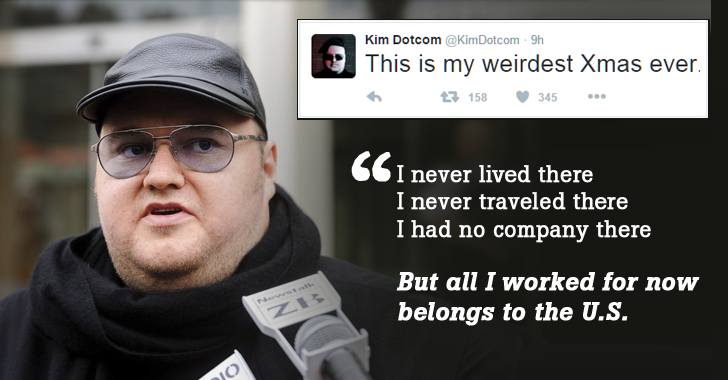 Enjoy your Christmas & know that I'm grateful to have you, my friends," Dotcom tweeted before the court hearing. The court ruling comes almost three years after the New Zealand police raided Dotcom's Auckland mansion at the request of the FBI and in the same year the US government launched extradition proceedings. It was a high-profile armed raid (you can watch the raid video below), but it has taken almost four years for the courts to reach a decision on whether to send Dotcom to America. The US government estimates the harm to film studios and record companies was more than $500 Million (£322 Million). However, Dotcom and three defendants now have 15 days to appeal the court ruling. "Justice was not served today," Dotcom's California-based lawyer Ira Rothken tweeted, confirming their plans to appeal the US extradition request in the High Court. "The @KimDotcom team looks forward to having the US request for extradition reviewed in the High Court. We have no other comments at this time," Rothken said. However, the defendants are allowed to remain out on bail in the meantime. Although the judge insisted that all the defendants should be ordered to report to probation every day.